An audience gathered in a small auditorium one evening last November on the campus of California State University, Dominguez Hills. Waiting for the recital of student jazz combos to begin, the usual pre-concert scene unfolds: people saving seats, student performers greeting friends, families, and professors who have come to support them. Other students who are running the house are moving to and fro in preparation for the performance. When the recital begins, the energy in the room turns toward the students, who do not disappoint. Their parents and classmates are visibly impressed at the unexpected talent of their offspring and friends. In the middle of the recital, a member of the music faculty appears with a quintet, and a palpable vibe of adulation begins to rise, not just from the audience, but from the players onstage. A veteran player with a considerable list of concert, recording, film, and TV credits that belie his age, Teodross Avery has upped the game for a little-known division at the state university, and joined the music faculty as assistant professor of Jazz Studies and Commercial Music within the university’s music department. As a teenager in Northern California, Avery connected with Wynton Marsalis when the trumpeter-educator purchased instruments for talented young musicians. Not only did Avery benefit from receiving an instrument from Marsalis, but he was also fortunate enough to meet and receive pointers from the accomplished players in the Marsalis organization, with whom he jammed with when they toured his community. At 17, Avery won a full scholarship to the Berklee College of Music in Boston, and got the attention of Carl Griffin, A&R executive at GRP/Impulse Records, who signed Avery at 19. In 1994, Avery’s first album, “In Other Words,” was received with great acclaim, including a five-star review in USA Today. While still an undergrad, Avery was in great demand, and backed the likes of Aretha Franklin, Betty Carter, and Ramsey Lewis while still completing his studies at Berklee, graduating in 1995. Graduating with an estimable amount of professional experience, Avery set out to conquer New York City. He performed at the legendary Blue Note with the Cedar Walton Sextet, featuring Art Farmer. Avery also played and recorded with a variety of jazz greats including Dee Dee Bridgewater, Hank Jones, Ben Riley, Harold Mabern, Cyrus Chestnut, Lewis Nash, Donald Harrison, Bobby Watson, and The Roy Hargrove Big Band. His second album, “My Generation, was released in 1996 on the GRP/Impulse label. The James Moody classic, “Moody’s Blues” is subtitled “Teo’s Licks” on “Frank,” Amy Winehouse’s 2003 jazz-tinged album. Avery has portrayed musicians – actually playing onscreen, instead of actors who simulate playing instruments – in films and television, including appearances in “Love Jones,” “Beauty Shop,” “Black-ish,” “Saturday Night Live,” and the MTV Awards. Avery earned his Ph.D. in Jazz Studies from USC in 2016. He also holds a master’s degree in music from the Steinhardt School of Education at New York University. Avery is also the recipient of numerous awards, including The Sony Innovator Award (1992), The National Foundation for The Advancement in The Arts’ Clifford Brown/Stan Getz Fellowship (1992), and The NAACP ACT-SO Award (1991). At a state school that is geared toward preparing students for careers, Professor Avery’s faculty appointment could not be more beneficial. He shares his experiences, many of which are probably common among his students – some of whom are already working in the music industry while earning their degrees – including parental support in pursuing a musical education, early recognition of his talent, and the multigenerational teaching and learning that is one of the hallmarks of the jazz genre. How was music a part of your upbringing? My dad … listened to jazz, rock, West African music, blues, all different styles of music. My mother is from Ethiopia, so I heard a lot of East African music through her. East African and West African music are so different, but there are similarities as well. My dad really turned me on to good music and such a diverse group of musical styles. He always admired people like Jimi Hendrix, Eric Clapton, and real guitar players. He started me on the guitar when I was ten. His feeling was that if I could learn to play classical guitar music that I could play anything – which is totally not true. [My father] meant well and it was a great way to get me excited about music. Learning how to play etudes and arpeggios will teach you how to play your instrument in a complete manner. Classical music can prepare you technically but it cannot prepare you in terms of learning popular music styles, or how to groove or how to be an improvisational musician. You have to let go of that, to achieve the spontaneity of [jazz]. A lot of musicians who were classical musicians, they can read anything on the page. But the best jazz is the opposite of that. Is the ability to groove more internal? It’s internal, but it’s external too. The best jazz is in the moment. You don’t know what’s going to happen. You’re playing with three or four other musicians … reacting to what you’re doing, and you’re reacting to them. There is some analyzation that goes down. You have to figure out, ‘How does this piano player play? What kind of voicings are they using? Do they swing? Do they play on top of the beat or behind the beat? What players are they influenced by? They play this, you play that – how will the bass player react to the drummer. But nothing is based on what’s on the page. It’s a constant conversation in the music. Along those lines of interaction, what unique skills do jazz musicians bring to telling stories on TV and in film? If you really play improvisational jazz, you’re dealing with spontaneity and following other musicians, being intuitive and reacting to their reactions. In dialogue, you’re hearing words. The music that you compose [and play] would be directly related to the dialogue in terms of interpreting what [the words] mean. Dialogue tells you where things are going. Or, the movement – say there’s dance involved – will give you the information you need in order to write stylistically. 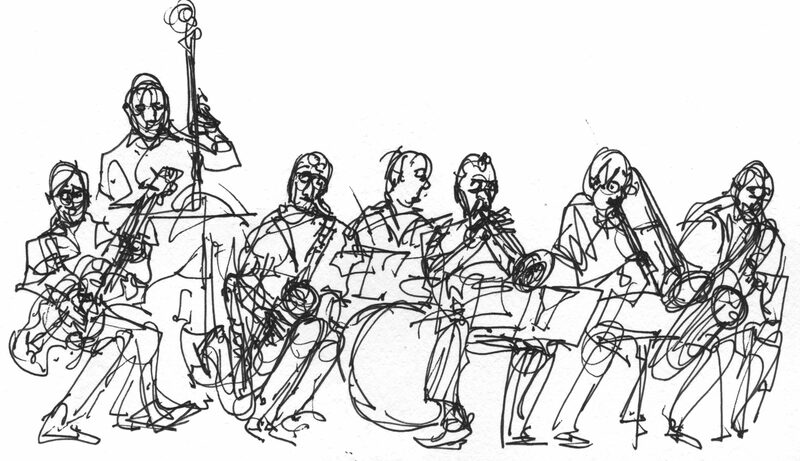 If you have a group of people dancing in the jazz style, you might compose something in swing. That’s why most movies that deal with jazz, you hear the swing approach in the types of music, even if it’s a small group performing the music, it will be out of that style. Do you always see a script or the film or show before you compose? Not always. With “Love Jones,” the director, Theodore Witcher, just explained what was going to be happening over the phone. We had this scene in a club called The Sanctuary. This club is where all the poets meet up and perform spoken word poetry with the band. He said, ‘We have a song that we’d like you to play.’ I said, ‘Cool,’ but I had no idea what that would look like. I didn’t know what the room would look like, I didn’t know what the dialogue was between the different people. So, I just showed up and based on what he said, I figured we could play the song. When it happened, we were able to adapt. Were you able to bring in your own musicians? I brought in my own musicians. We all went to Chicago to film the movie. I brought in a guy named Carl Allen who was recently the director of jazz studies at Julliard until a few years ago. I had a bass player by the name of Marcus Shelby, who’s in the Bay Area; he’s from L.A. [originally]. And then a guitar player from Chicago named Jeff Parker who’s doing very well. When you do live TV, are you there with a specific artist, or for the entire broadcast? I did “Saturday Night Live,” and the MTV Awards with Lauryn Hill, TRL with Shakira, and “The Today Show” with Matchbox Twenty and a bunch of different shows like that. I’m there with a specific artist, not part of the pit band. The house band – if you have a special artist perform – might request certain [musicians], and I’ve been one of them. Usually, you’re part of a tour. When I was with Lauryn Hill, we were on the road for a year. When you’re on tour, you’re in a different city every two days, maybe every day. When we were in New York, we would do Madison Square Garden and then do “SNL,” it’s just part of the whole tour. It’s different when you’re not on tour and you do a TV show. I did a long run with Shakira for Spanish-language television stations like “Sabado Gigante,” and MTV’s “TRL.” We did a giant stadium performance where a soccer team was playing in New York – a promo for her single, “Hips Don’t Lie,” with Wyclef Jean. When you’re onscreen, do the actors and the director interact with you? They come by and talk to us a little bit. Someone like Anthony Anderson will come by and tell a couple of jokes. Comedians – the real ones – can never stop telling jokes. The [singers] often perform with musicians so they naturally gravitate towards the band. Except Mary J. Blige – she never talks, she’s always in her zone. To [be] a diva you have to remain wordless to the lesser types. (laughs) You have to be focused. How did you get the attention of Wynton Marsalis? At the time – 1986 or 1987 –my dad lived an hour north of Oakland, in Vacaville, and it was quiet out there. There wasn’t much going on there, he lived in the country. It’s great if you want to study – I got very good grades because there was nothing to do. And it’s great for practicing because you have a lot of time on your hands. I would practice for six to eight hours a day over the summer, just playing all day, listening to albums, checking things out. One thing you did was look through newspapers and see who was coming to town: Wynton Marsalis, Art Blakely, Freddy Hubbard, the ? Brothers, Nat Adderley – all these great performers. I read in The San Francisco Chronicle that [Marsalis] would buy instruments for up-and-coming musicians. I had a saxophone that was not that good and I needed to really upgrade. I inquired about the possibility of getting a saxophone, and his tour manager, David Robinson, said, “Yeah, we do that.” I asked how I could audition. I sat in with Marsalis and played for him, and he got to see how serious I was. It was great, because when you’re at that age, you’re very malleable. You can go either way with it – you can quit music or you can continue to play. A situation like that where someone buys you an instrument can keep you totally excited about learning to play. When [Marsalis’s group] would come to town, I would seek them out and try to play with them and take pointers from them. They would say, “You need to try this, you need to try that. Listen to this player.” And you’d learn the music even more like that. But it wasn’t like being part of a formal institution. What are the pros and cons of learning the way you did, and of being enrolled at a music school? Jazz, in the past few years, has been heavily dependent on the institutions, and that’s been great for the music. But it really comes more out of an oral tradition, where musicians learn and take direction from older musicians. That’s how they really learn the music. That is just as important as being at an institution. Formal programs are great, but in addition to that, a student needs to talk to and learn from an accomplished musician. Sometimes, it could just be a 20-minute conversation on a [musician’s] break. They can set you on a path that will be valuable for you as a young artist. You will get the inside information. Let’s face it –not everyone is in on the same scene. That teacher at an institution may have [an academic] perspective, but a teacher who is out playing and touring around the world and teaching, will have a different perspective. That is why I was chosen for the position [at Dominguez Hills]. So, what drew you to add “educator” to your list of credits? I want to give students what I wanted when I was a student: An education from a professor who also has extensive professional experience, as well as recording, touring, writing and production experience. Yes, it’s different from other styles. In classical music, you see that a lot too. But you don’t see that much in R&B or rock, when there’s a tribute. It’s never just a natural exchange. Who were some of your greatest mentors? Wynton and Branford were two great mentors; so was Freddy Hubbard. Some of these people I would just go listen to and I would ask them a question. Or, I would play with them. A lot of times you could learn by how they played – they would be telling you what to do by the way they played, not necessarily by saying it. And, it’s what they don’t say. They’re telling you things by what they don’t say. If you were a young musician playing with older musicians, and after the job they said, “You should listen to Ben Webster play ballads,” that means you don’t play ballads well. Or, they might say, “It’s important to learn the lyrics to songs when you learn [to play] them.” That means, you don’t know the lyrics to songs. They’re trying to help you out and they’re hoping that you’ll get what they’re saying. But it’s up to you to be wise enough to understand. The average jazz musician is not like the average rock or blues musician, where it’s about being totally expressive in the most straightforward way. Those people will just say, “You don’t know the lyrics to songs and you sound like crap playing behind me.” So, you have to decipher [jazz] musicians because they’re very terse – they’re not going to say a lot. What is an example of when you were coming up and someone gave the kind of criticism to you? The majority of my experiences – I know how to figure stuff out without people really telling me much because of those experiences. For instance, most jazz is playing instrumental versions of vocal songs. I’ve had vocalists say, “You need to learn the lyrics.” Betty Carter could tell if you didn’t know the lyrics. Let’s say Hall & Oates, “Your Kiss” was covered by a jazz musician [and] was written 70 years ago. If I was playing with you as the vocalist, if I didn’t play that chorus true to the melody, that would be a perfect time to tell me, “You need to go and learn the melody,” because you’re dependent on me playing it like it’s been played and how you’ve sung it many, many times. I’ve been in situations like that with a mature vocalist who sings songs from her time. You can’t really get away with [not knowing] this stuff in jazz. If you play with older musicians, they’ve played with older musicians, and they all know the same songs. If they play, “All the Things You Are,” they’ve played it over and over and over since they were 18, and they’re 70 now. When they were 18, they were playing with a 70-year-old who knew that song as well. So, when you come along and if you’re not playing that melody, everyone’s going to know. As a seasoned, real-world musician who also has the academic credentials, how do you prepare your students for the industry? This is the classroom, but this is a stepping stone to a professional career. I preface everything by saying, “You will need this as a professional later.” Maybe they might not want to accept what I’m saying. At that point, I say, “Hey – I’ve done this many times, so trust me. I usually tell them straight and it connects all the dots. One day, another musician will be interviewed by another writer and they will ask them, “What was it like being taught by Teodross Avery? What do you think the musician would say? I think they’re going to say I gave them the real deal. That I was telling the truth and that I tried to give them what they needed to be successful. And that I was also concerned about where they were going to go, what they wanted to study and perform. That I did not have a one-size-fits-all approach; that I listened to them.